Dam is one of the best Juanada 7 daughters ever at Cole Creek Angus Ranch. We are very pleased with our first calves by Ridge Line. They are light birthweight, nice growth, and excellent conformation. This is a bull that will do a lot of great things for us. 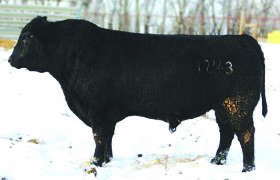 Purchased in the 2014 Cole Creek sale (retained interest) with Elston’s Lone Tree Angus Ranch, Spiritwood, ND. Ridge Line is being used heavily by all three owners.